If the thought of cooking a large bird totally freaks you out, there are plenty of alternative Thanksgiving meals that will give you that holiday feeling without all the fuss. 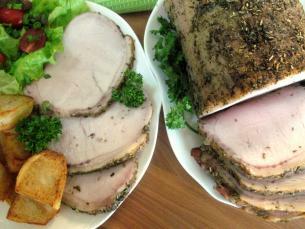 Pork Roast: Many beginner cooks are nervous about cooking a large piece of meat. Kathy’s photo-tutorial on cooking a Pork Roast is a great guide to cooking “the other white meat”. Adding apples and cinnamon will ensure that no one misses the turkey when you serve this dish. It smells and tastes like holiday heaven. Ham: Baking a ham makes for an impressive meal without the crazy level of work. When buying a ham, make sure it says fully-cooked somewhere on the packaging. This means that all you’re doing is heating the thing up! I suggest you find a ham that comes with a packet of delicious brown sugar glaze to add on top. Depending on the size of ham, you’ll probably bake it for about an hour. Just microwave yourself a baked potato following Kathy’s instructions, and open a can of cranberry sauce and you’ve got a terrific seasonal meal in 60 minutes. Roasted Chicken: If you’re set on a bird for Thanksgiving, why not try one that is slightly more manageable in size? A roasted chicken certainly qualifies as a solid turkey replacement. You can follow Kathy’s video instructions on how roasted a chicken. 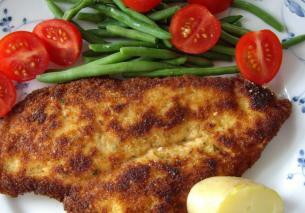 Turkey Cutlets: It’s just like cooking chicken cutlets! Thanksgiving Jambalaya: You can substitute any meat here: turkey breast slices, chicken, shrimp or whatever you fancy. You can make it spicy or keep it mild. Guests will be impressed that you’ve bucked tradition and think you’ve worked for hours on this one. Baked Cod or Microwaved Salmon: Who says you can’t serve fish on Thanksgiving! If you really want to impress your guests you can add a creamy mustard sauce or a decadent saffron sauce. 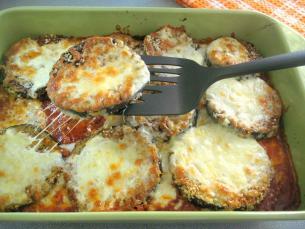 Eggplant Parmesan: Both vegetarians and non-vegetarians alike will love you for this. My oh my, Spaghetti Pie! Pumpkin or pecan pie may be traditional but why not try spaghetti pie! 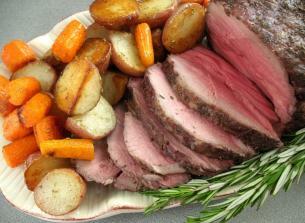 Leg of Lamb: Kathy will show you, with her step-by-step photo-tutorial, how to make this great roasted leg of lamb. Beef Stew: By the time this (video) recipe is done cooking, your house will be filled with the most amazing aromas. For Thanksgiving, it has to be turkey. But we do it the easy way . . . with Stove Top stuffing, etc. Takes just as good and I abandon my eating plan just for the day. Don’t forget the tofurkey! That’s a great alternative for vegans and vegetarians. Summer, Yes there are so many wonderful alternatives for vegans and vegetarians when it comes to holiday menu planning.